We have been quite quiet over the last three weeks with only ten runners during that time. Most have run with promise, however, a few have put in head scratching performances. The first of those were Coolongolook and Warsaw Road who ran at Newbury and Newmarket respectively on Friday 18th May. Coolongolook was stepping up in trip to a mile and a quarter and pulled far too hard even though the winner, who made all the running, set a blistering pace. Warsaw Road was also stepping up in trip to a mile and was another to pull hard through the early stages. Again, the winner made all on the far rail in a four runner contest with the others opting to come down the centre of the track. Although Warsaw Road eventually ended up on the far rail the winner was not going to be pegged back. Outlane made a promising reappearance at Newmarket the following day over a mile and a half in a fillies novice. George Wood was hard at work early in the straight, however, as her pedigree suggests, she is an out and out stayer and kept on gamely to finish third. Alwaysandforever (pictured) came on from her seasonal debut at Wetherby to win easily at Windsor on Monday 21st May. Stepping up to a mile and three furlongs in a fillies handicap, she took up the running early on and stayed on well under Ryan Moore to win by 9 lengths. The future aim will now be for some Black Type. Four White Socks finally made her racecourse debut, also at Windsor, in a mile fillies maiden and finished second to, what looks like, a decent filly of Ed Walker’s. She will undoubtedly come on for the experience and will also benefit from a step up in trip. 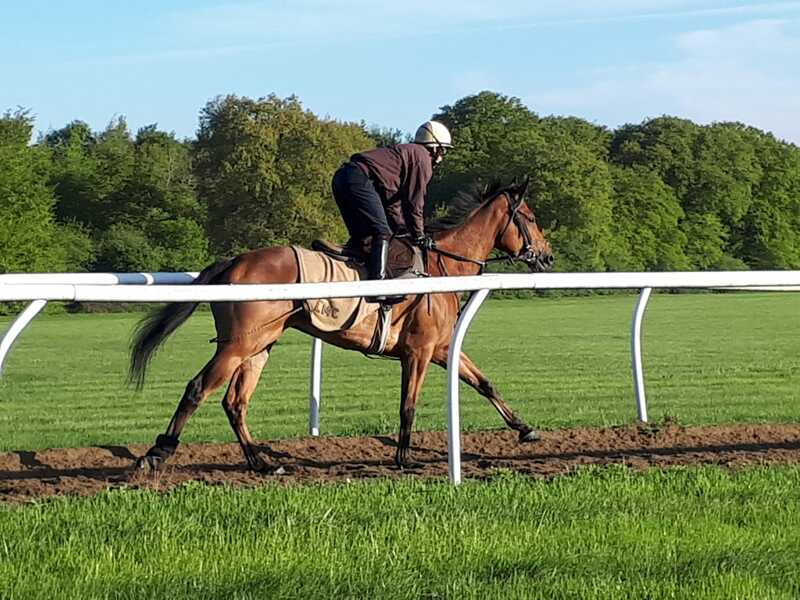 Edelline was another to make her racecourse debut at Goodwood on Thursday 24th May over a mile and a quarter. She looked very green under Andrea Atzeni and hopefully the experience will sharpen her up. The same day over at Chelmsford, Drill came up against just one that was too good in a 14 runner novice over a mile. He has earnt himself an official rating of 79 and there will be more options available for him now that he is eligible for handicaps. Plentiful, who is a half-brother to Postponed and God Given, made his racecourse debut at Redcar over a mile and a quarter. Standing at 17hh, he only came in to training as a three year old due to being so big and backward. Although he finished fourth he was beaten 16 ½ lengths, however, he showed enough promise to think he can win a race over further. Ashington put in a career best performance when finishing second at Leicester on the same day. Cheek pieces were applied for the first time and he was given a canny front running ride from Andrea Atzeni only to get pipped on the line. He showed a lot more determination than last season and responded well to Andrea’s urges so, again, I would like to think that he is capable of winning this season.